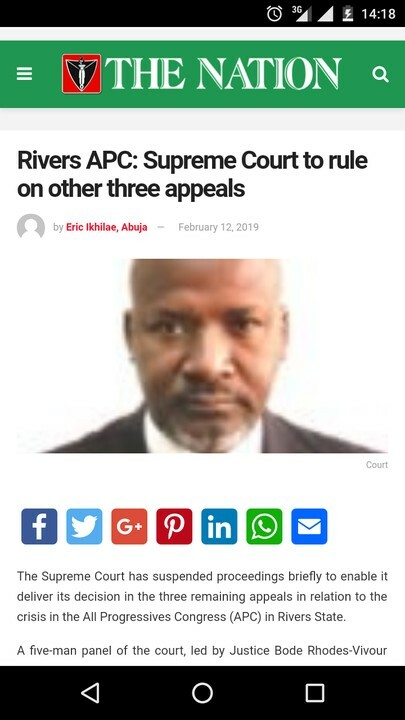 The Supreme Court has suspended proceedings briefly to enable it deliver its decision in the three remaining appeals in relation to the crisis in the All Progressives Congress (APC) in Rivers State. A five-man panel of the court, led by Justice Bode Rhodes-Vivour rose a moment ago after taking arguments from lawyers representing parties in the three appeals on the objection filed against the appeal by Ibrahim Umah and 22 others. The appeals, which were, this morning, consolidated by the court are SC/81/2019 (another appeal filed by APC), SC/1332/2018 (by Ojukaye Flag-Amchree) and SC/1334/2018 by Tonye Patrick Cole and others). The court took arguments on the objection filed against SC/1332/2018 (by Ojukaye Flag-Amchree) and said its decision will cover the other two appeals. The court is expected to resume again any moment from now to deliver its judgment.